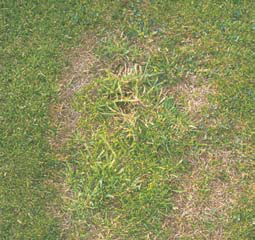 Take-All Patch is most commonly found on newly constructed sand based greens/lawns (normally 2-8 years old). Soils with low CEC, poor nitrogen fertility and with a high pH (>6.5) are suitable conditions for Take-All Patch to take hold. 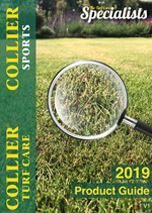 Take-All Patch primarily attacks Bent (Agrostis) grasses. Ensure good availability of nutrients in poor nutrient holding soils. Try to reduce pH of soil so that conditions are less favourable to pathogen. Increase biological activity in the new sand environment so that there are more natural antagonists to the pathogen. Manganese (Mn) has be shown to be effective as part of an integrated approach. Apply Step Hi-Mag as a good source of manganese. Check water quality for pH and nutrient levels. Use acidifying feeds such as ammonium sulphate based fertilisers. Avoid organic fertilizer, which tend to increase ph. Avoid potassium nitrate, which increases soil surface pH. Apply Heritage Maxx (Azoxystrobin). A second application may be required two weeks following the first application. Always add Prestige Super Recovery to each fungicide application.